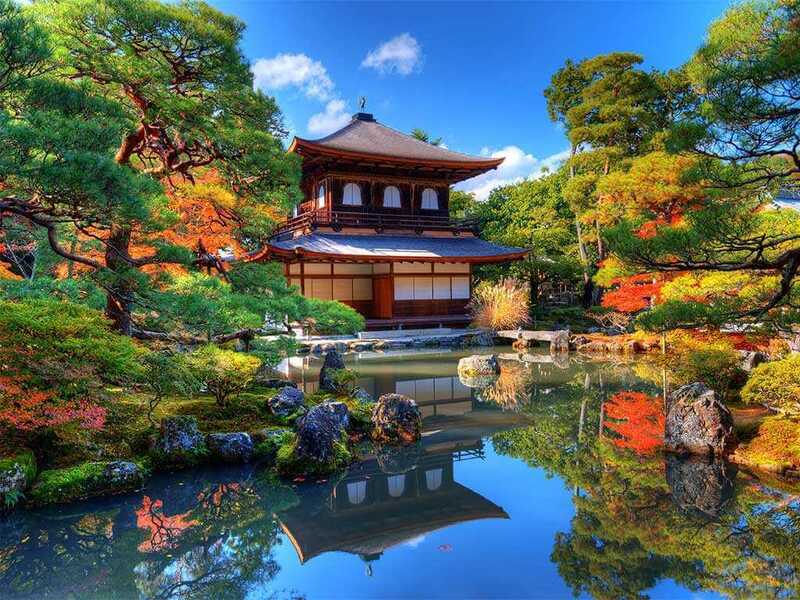 The gist is that if you can get a killer deal on a long-haul international flight to the continent you want to visit, you can pair that with a cheap regional flight (or even a train or bus ride) to get to your final destination. This multi-step transportation approach does require more logistical attention on the part of the traveler, but we’ll walk you through what you need to know and point out potential issues you need to be aware of before you book a flight. The good news is that the basics are pretty straightforward. It’s something of a two-step dance, if you will. Book one ticket for the cheapest international fare across the ocean/to the continent you want to visit. Book a second ticket on a budget local carrier (or a train or bus trip) to get where you want to be. This could mean you fly from your home airport to a hub airport across the ocean and then fly (or take a bus, train, or car ride) from there to your final destination. Or, it could mean you fly (or take a bus, train, or car ride) from your home to a larger airport on the same continent and then depart from there to cross the ocean. For example, if you live in San Francisco and want to visit Inverness, Scotland, it's likely cheaper to snag a cheap flight from SFO to London (like the $456 non-stop fare we recently sent to members) and then hop a local low-cost carrier from London to Inverness. If you live in Orlando and want to visit Lima, you could snag the $227 mistake fare from Miami to Lima and take a cheap local flight (or drive) from Orlando to Miami to catch that international flight. If you live near a major hub and are flying to a major hub (e.g. you live in NYC and are flying to Paris) you're probably better off booking a single ticket; you can probably even find a great deal on a direct flight. It's the smaller airports, more far-flung destinations, and less-traveled routes that benefit the most from this travel hack. Traveling from a larger hub to a smaller city, such as London to Jacksonville, Florida or NYC to Bordeaux, France. In this case it's often cheaper to snag a deal across the ocean to a major hub and then take a regional flight (or car, bus, or train) for the final leg. 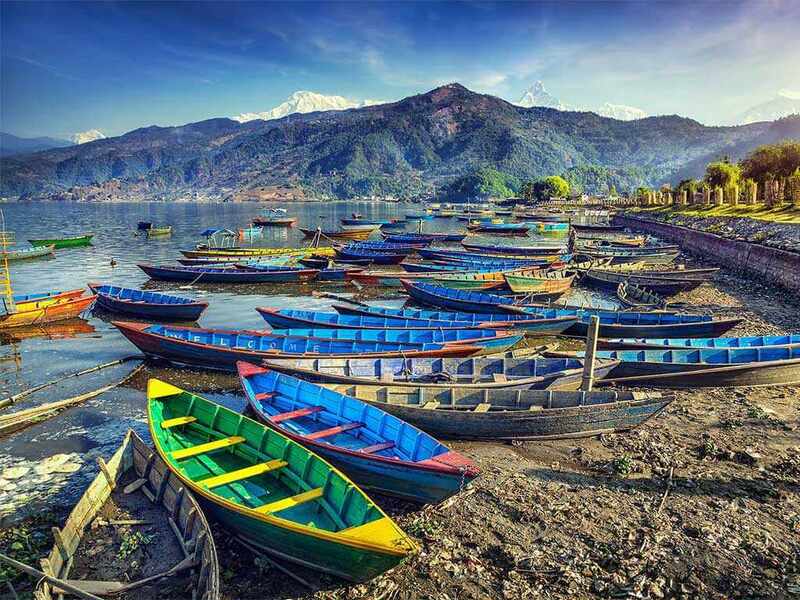 Traveling on a less trafficked route, such as from the US, South America, or Asia to Eastern or Southeastern Europe (Romania, Bulgaria, Croatia, etc.). Look for a cheap flight to a Western or Central Europe hub (London, Zurich, Frankfurt, etc.) and then take a regional flight from there. Traveling to an island destination on a long-haul journey, such as Vancouver to Puerto Rico, or Chicago to Sicily. Get to to a nearby hub (such as Miami for Puerto Rico and Rome for Sicily) and then look for a cheaper hop to the island. This method also works for snagging a too-good-to-miss mistake fare. For example, if you live in Austin and we send out a mistake fare for business class from SFO to Bangkok in the $600s, you can use this trick to get yourself from Austin to San Francisco cheaply so you can ride in style over the Pacific. The obvious reason is to save money on your trip (that is what we’re all about, after all), and the savings can be pretty spectacular. 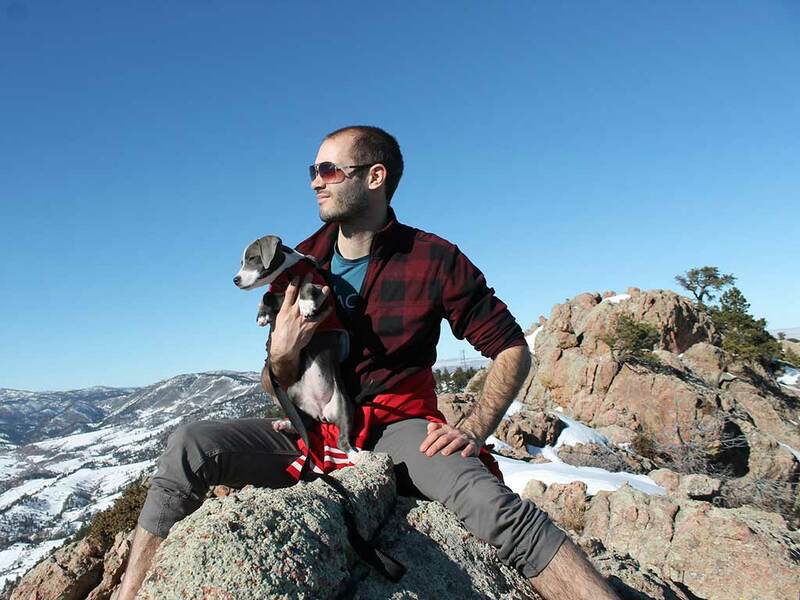 But that’s not all this travel hack has going for it. Let’s say that first ticket—the one that gets you to the continent you ultimately want to be on or connects you to an airport that has a cheaper flight across the ocean—happens to land you in a city you’ve always wanted to visit. There’s no rule that says the second ticket has to follow the first one immediately—they’re unrelated itineraries. Build a few extra days into your trip and explore that city on a long layover before you head to stop number two. Another benefit: If you're going to a region with lots of cheap ways to get around (like Europe), you don't have to book both legs of your trip at once. Say you find a great price to Frankfurt, which is well-connected to dozens of other cities. You can jump on the deal, secure cheap passage to Europe, and then take some time to figure out where you want to go. Connection timing: When you’re shopping for the second leg of your two-step journey, be sure you’re allowing for enough time between flights (or between flight and train, etc.) to get from one to the other— including the time you’ll need to collect your bags from the first flight and re-check them on the next one (unless you plan to go carry-on only). Airport location: That cheap long-haul flight might put you in one airport, while the budget carrier flies from another. 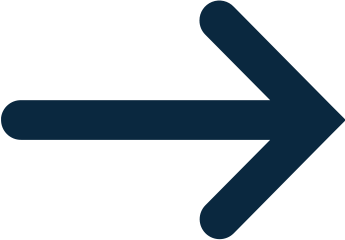 Account for any time you’ll need to take ground transport from one airport to another. Total costs: Sure, you might have found a cheap international flight, but don’t buy it before you check on the cost of the next leg of the trip. If there isn’t a budget flight available, or train tickets are astronomical, that may wipe out any savings you gain with the first flight. In that case, booking two separate tickets is probably more trouble than it’s worth. Immigration and customs: As far as the airlines and immigration officials are concerned, you are flying to that first city therefore if you are coming from another country (or i the case of Europe, going from a Schengen Area country to a non-Schengen country, or vice versa) you will need to go through all the rigamarole of passport control and customs. It matters exactly zero percent to them that you’re planning to go right back through airport security to get on another plane. Allot enough time to go through immigration, customs, and, if needed, retrieve your bag from baggage claim. You'll then need to re-check any luggage, and go back through security. Visas: If the country in which you arrive requires that you have a transit visa to be there, you’ll need that, too. Again, they don’t care that you’re not staying. 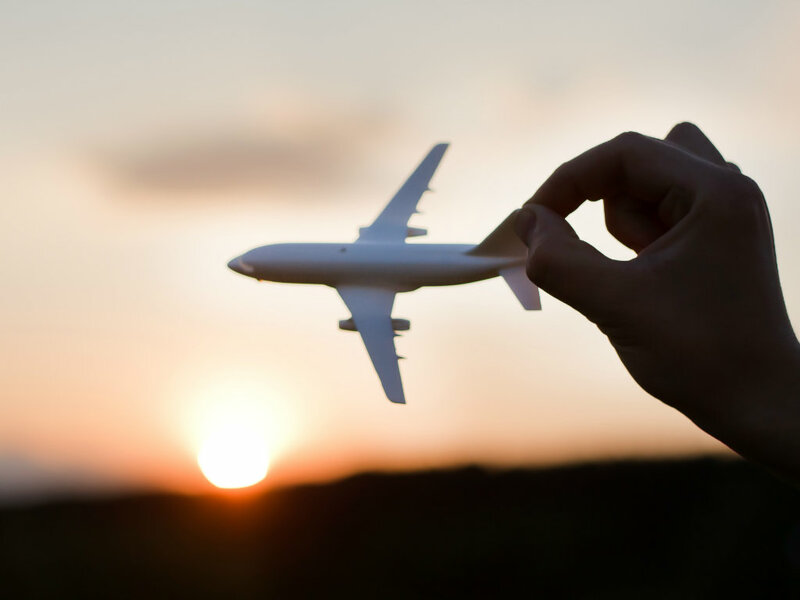 Before you book a super-cheap flight, then, find out what paperwork (if any) you’d need for the first country you arrive in, and whether the costs of that paperwork would wipe out any savings you’d gain from that cheap flight. 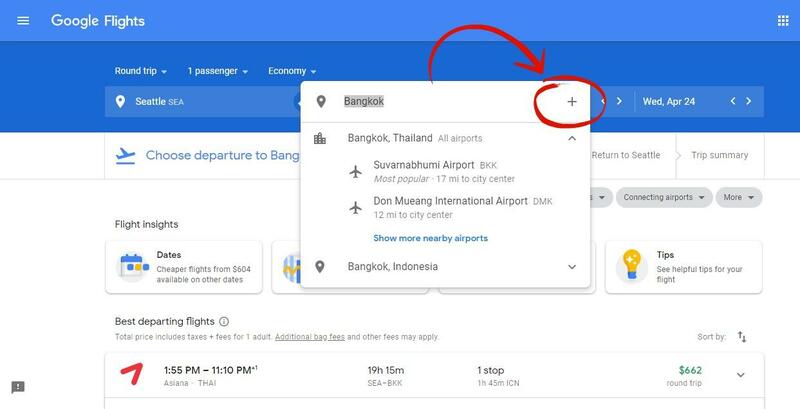 Depending on where you’re going, there are a couple ways to use Google Flights to begin your research: browsing the “Explore” map or scanning the calendar. When you’re looking at a trip to a continent that has lots of potential hub airports close to one another, starting with the map is a great way to see low prices to a larger area. Europe and parts of Asia are both good candidates for this method, no matter where you’re flying from. You’ll see on the map below that London—a major European hub city that often has some of the cheapest fares into Europe—doesn’t have the best fares right now on flights from NYC for two-week trips in the next six months. Dublin, Amsterdam, and Berlin all have $300 fares, and Paris has one for $296 round-trip. If you’d like to go to Munich, for instance, you might want to fly into Berlin first because it’s cheaper by nearly $150. Next, you’d check out the price of connecting from Berlin to Munich. Rome2Rio is a great resource for this, as it compares prices for flights, trains, buses, and ride share services so you can see which option is the cheapest. At the moment, easyJet is showing fares from Berlin to Munich starting at around $80, while the 4-hour train trip can be less than $50. Either way, you’re saving money over flying directly into Munich. And check out this map: from Melbourne, flights to Athens are surprisingly cheap (again, for a two-week trip in the next six months), so even if you actually wanted to go to Rome or Istanbul, for example, it would be a very good idea to consider using Athens as your European entry point. Ryanair is currently listing fares starting at $50 from Athens to Rome, and Aegean is showing fares to Istanbul starting at around $100. In this example, using this travel hack to get to Rome through Athens saves you more than $120—and to Istanbul, the savings is more than $320. Nothing to sneeze at, y’all. Google’s Explore map is well-suited to Asia trips, too. While Cambodia might be where you want to end up, this map will show you how much you’d save by flying from Chicago to Bangkok or Ho Chi Minh City rather than to Siem Reap. Fares from Bangkok to Siem Reap on AirAsia are often $200 or less, which still saves you more than $780 using the prices listed on the map. That’s $780 you can spend in Cambodia—or save for one of those round-trip flights into Europe on the earlier maps. But look at fares to Athens instead. The lowest prices are about half the cost of flying to Santorini. If your travel dates are flexible, look at the calendar to find out whether the price you’re currently seeing is the lowest one. Click on the calendar icon next to the departure date, and you’ll see a two-month spread. The lowest fares are displayed in green. Click the right or left arrows to change which months you’re looking at. In this example, maybe you’d rather make Santorini a Spring Break vacation instead of a summer trip, so you want to see fares in March and April. The $522 fare is pretty consistent until mid-March, so that can help you plan when you want to travel to take advantage of the lowest fares. From Athens, it’s easy to hop on a ferry to Santorini (or any of the Greek Islands), or take a short flight on a budget airline for under $100. 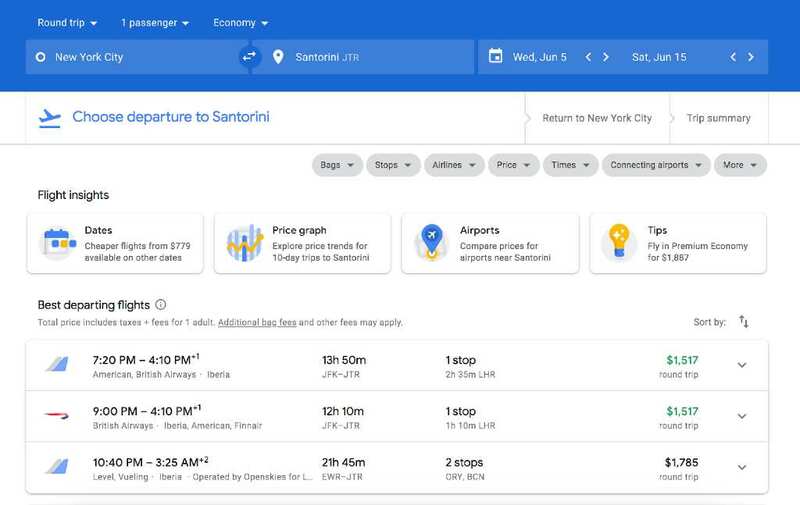 Compare that to the price of flights from NYC to Santorini on one itinerary and you can literally cut the cost in half or more. And that’s why we often refer to this cheap flight hack as "the Greek Islands trick." 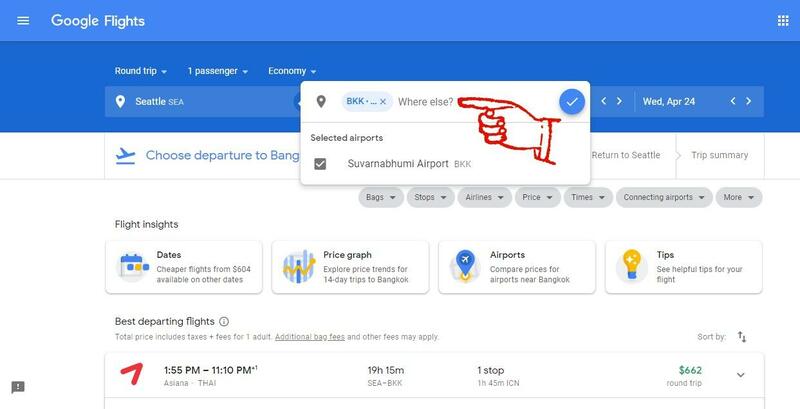 You can also use these booking fields to search a few airports at once, a sort of happy medium between the information overload of the map and the specificity of only searching for fares to one city. Begin typing in the next city name, and you’ll be presented with options like the list below. 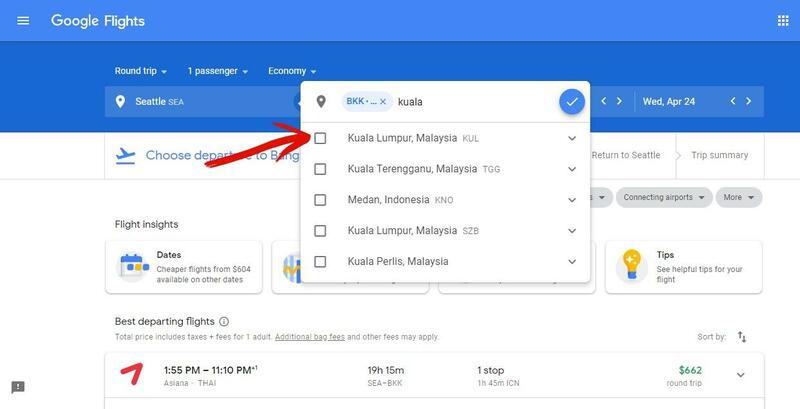 In this case, typing “kuala” brings up airports in Kuala Lumpur. Check the box next to the one you want to add to the list. Keep doing this for as many airports as you want to look at (up to seven)—and remember you can do the same thing in the departure field, too—and then click the blue circle with the check mark inside it. The results that appear now include all the airports we typed in: Bangkok, Kuala Lumpur, and Singapore. With set travel dates, this is an easy way to find the best fare to get you close to your holiday destination. And, of course, if your dates are flexible, you can then add the steps outlined above for checking the calendar for cheaper travel dates. Want to visit Cape Town? Flights into Johannesburg are likely going to be your best bet, price-wise, followed by a flight on an African budget carrier from Joburg to Cape Town. Going to South America? Travelers starting in the US or Canada should consider finding the best deal on a flight to Miami first, followed by another ticket to wherever you want to go in South America. Coming from Australia to see the United States? Look into the cheapest fare you can find into LAX or SFO, from which point you can find a cheap domestic flight just about anywhere else in the country. 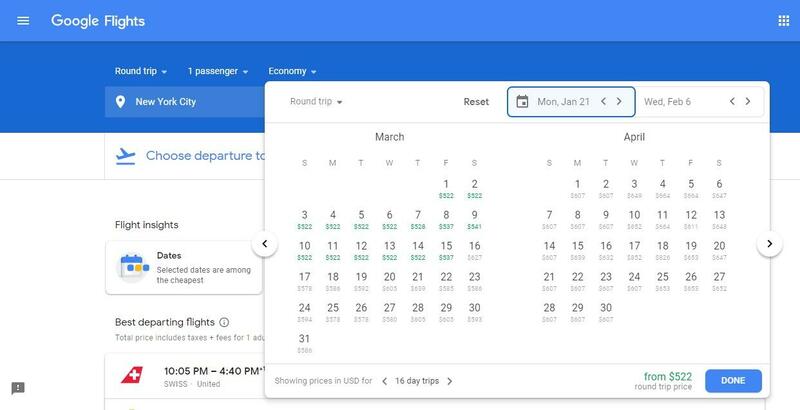 Using this trick does require additional legwork on your end, and you should always compare the cost of booking two separate flights to the cost of booking to your final destination on one itinerary. 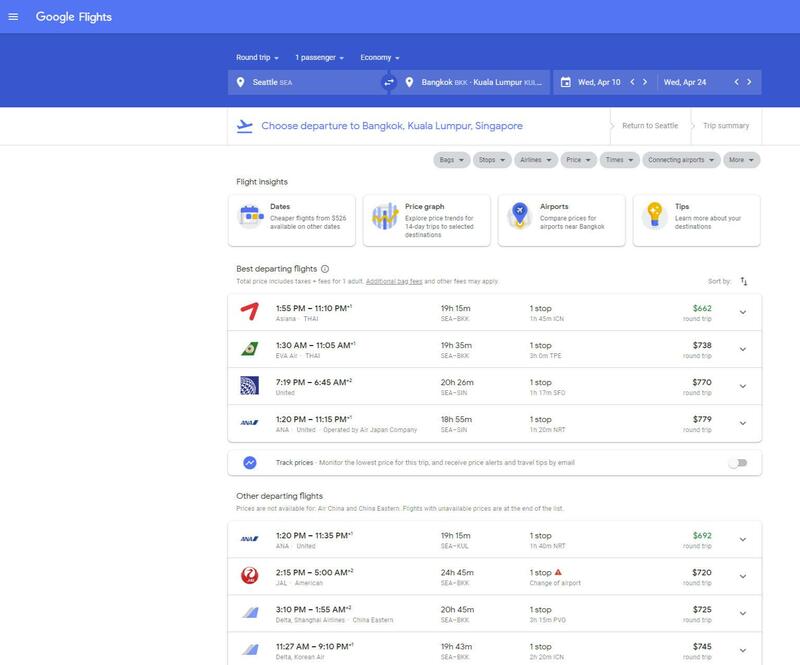 While this trick can help you find the cheapest flight to just about anywhere, it doesn’t result in the cheapest flights 100% of the time. There might be a crazy deal to Santorini, and if you assume from the outset that it’ll be cheaper to fly into a bigger hub you risk adding unnecessary steps to your trip without the associated savings. We recommend going through the steps outlined above so you can make well-informed decisions once you’re ready to buy. Additionally, this is an instance where you’ll want to be a bit more cautious about timing, and add extra time in between each leg (a full day is a good idea; it accounts for delays and allows you to spend time in another destination). 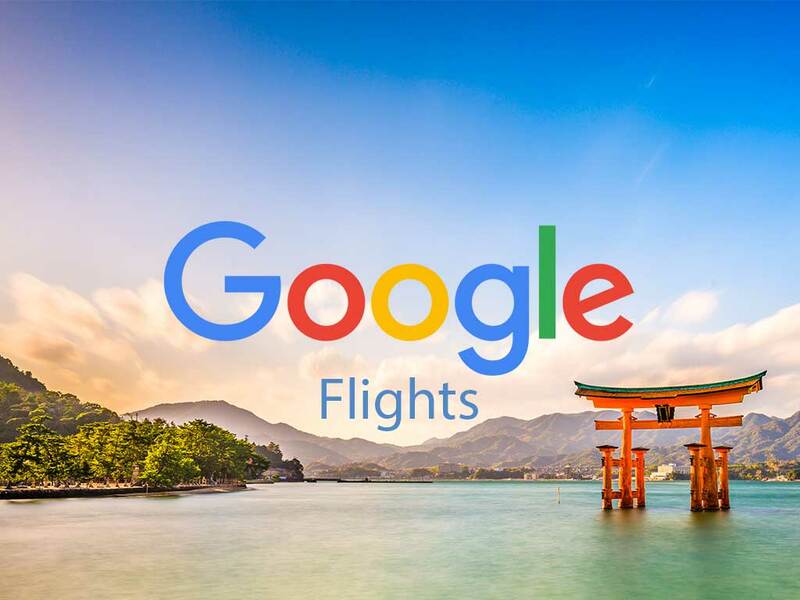 When booking on Google Flights, take note of whether the flight is frequently delayed. You don’t want to be in a position where one delayed flight can throw off your whole plan; because the tickets aren’t linked, if you miss one, the airline may charge you for a whole new ticket. If you can't avoid a tight connection, you may want to look into travel insurance and see if it will cover you in case of delays. 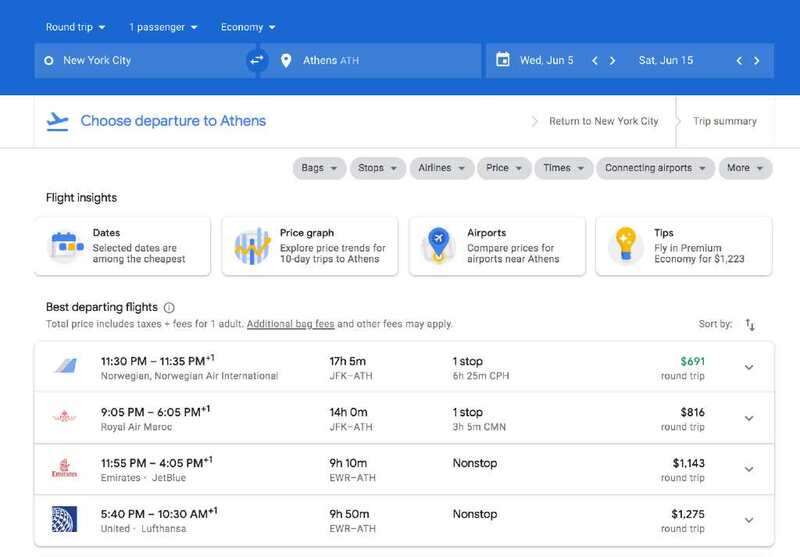 If the worst that happens is you land late in Athens, miss your connection to Santorini, and have to spend another $100 to get on a later flight to the island, insurance may not be worth the cost. But, if you’re doing this the opposite way—catching a cheap flight to Miami and then flying onward to Buenos Aires, for example—you’d be out a much greater sum if that hop to Miami is delayed and you miss your international flight. Before you decide for or against insurance, evaluate your risk and how much you stand to lose in case of delays. Join 1.6 million members of Scott's Cheap Flights and get cheap flight alerts delivered right to your inbox.